Yu-Shan’s gates are pretty much indestructible – and Gaia went to some trouble to pull most of them back within the borders of creation during the reshaping. In fact, she managed to pull most of them quite close to the center of the universe, the better to conceal them from the Unshaped Hosts. Thus many of the gates open to Earth – and most of the remainder open to places within the solar system. To start our list of modern gates, here are the ones that used to open to the Blessed Isle – an area that now roughly corresponds to Eurasia. 1) Iceland. Buried deep within the throat of an active volcano, this gate has led a few courageous explorers – during lulls in the volcanic activity – to describe a fantastic realm hidden deep within the depths of a hollow earth. The ancient ruins buried far beneath the surrounding lava flows and sheets of ice would be quite a revelation to the modern world. 2) Deep beneath the waters of the Atlantic, this gate resides in the silt-covered ruins of a modest settlement. Unfortunately, it is little-accessed these days, and continues to be guarded by a fabulous seagoing behemoth capable of perceiving and blasting both spirits and physical beings. Given the near-uselessness of the gates current location, and the considerable power of its guardian (which has fed for eons upon the energies of the gate itself), no one has yet bothered to try and forcibly reopen the gate. 3) On the Azores, along the Mid-Atlantic Ridge, a gateway is carved out of ancient volcanic rock. For unknown reasons it can be used by anyone, with no need for charms or magic – and so is usually kept closed and sealed. 4) About eighty miles off the coast of Ireland, this gate is buried in the sea floor, and is – every so often – used by various sea gods, who occasionally disport themselves in the waters about the Emerald Isle, gathering small cults and producing occasional god-blooded offspring to become heroes and myths. There has been something of a crackdown on the practice for the last few centuries however, resulting in much fading of the old traditions. ” episode. A few brave mystics continue to use the gate as a transportation network – ducking into one lake only to emerge from another – but few have the arrogance to keep popping up in front of a contingent of Celestial Lions without a VERY good reason. 6) In a grove of trees near Paris curious glyphs glow beneath their bark under the light of the moon and strange voices call at night. Here, where the magic of the gate is damaged and twisted by the long-forgotten death of a Primordial, a proper offering to the powers that once were can meld the flesh and souls of man and beast (Sacrifice an animal with the appropriate ritual and pick up to (Will + Occult) points worth of mutations. The user may spend a point of will to manifest or banish these mutations as a six-tick action). 7) Egypt, near Memphis. Located at the center of an ancient temple of Bast, material beings have a hard time reaching this gate, since they must worm their way to it through a tangle of fallen stone – the remains of the structure once erected by humans to enclose the indestructible gate and to honor the gods who occasionally passed through it. 8) Displaced into a pocket realm by the stresses of the reshaping, this gate hangs unseen some hundreds of feet above the ruins of Babylon in Iraq. From it’s pocket realm the whispering voices of the gods who occasionally visit to survey the middle east – a popular pastime of the War Gods – pass into earth. Even from ground level especially sensitive mortals can sometimes hear them, and tap their divine knowledge and power. As you come closer to the invisible portal to the pocket realm, that becomes easier – and if you can reach the threshold, you can simply stroll on through into an idyllic celestial realm even before reaching Yu-Shan. Sadly, the ziggurat that once allowed men to visit the gods has long since fallen. 9) Hidden in the Himalayas on the northern border of India, the Dhorash gate once opened into a divine sanctum used by the local nature gods. With the reshaping, the sanctum – a place of considerable power with manse-like characteristics – was bound into the mountains, becoming a hidden valley full of magic for it’s residents to draw on (including life-extension and healing effects) wonders of nature (including many magical plants and animals now extinct elsewhere on earth), and elegant structures – but the entire area can only be located by following a hidden trail through treacherous peaks. 10) In Japan, deep beneath Mount Fuji, sleeps the shattered remains of the Imperial Manse – and whatever is left of the Sword of Creation. Unfortunately, it is now buried deep indeed, and is apparently guarded by some of the greatest horrors of the underworld. A few suspect that the Jadefolk have reclaimed one of Autochthon’s greatest works, but most feel that the manse is probably derelict – and extraordinarily dangerous. Unfortunately, the gate was sealed with the Scarlet Empresses mystical key – and that has been lost for thirty thousand years. 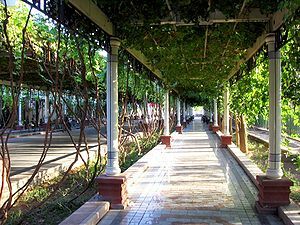 11) This gate emerges near Turpan City, China – once a stop along the ancient Silk Road, and still an important agricultural center. The gate overlooks Moonlight Lake, one of the lowest exposed places on earth. 12) In Siberia, the Tunguska gate has been unreliable ever since a wild flare-up of geomantic energies was triggered by some intrusion form outside of Fate. The warped geomancy of the area has caused some very strange things indeed to happen to gods who attempt to use the gate. Even stranger things happen to mortals. Given that the area – including the immediate area around the gate – has warped to the point that a variety of wyld pockets and pocket realms have spawned, has worried Yu-Shan to the point where the gate is usually kept sealed.